If you’re not in the Sandwich Generation now, you may be soon. The term refers to a cohort of people in their 40s and 50s who are caring for their older parents at the same time they’re responsible for their own kids. According to a 2013 survey by the Pew Research Center, nearly half of people in their 40s and 50s count themselves as a member of this cohort, with a parent aged 65 or older and a child either living at home or being financially supported. Why are the numbers so high? Credit a perfect storm of several factors. For starters, people are living longer, often with insufficient funds to manage retirement and healthcare needs. Kim Parker, lead author on the 2013 Pew study, found that 1 in 7 adults in their 40s and 50s provide financial help to elderly parents. That’s a result of both the increasing length of retirement and the increasing cost of healthcare—Fidelity Investments projects that a 65-year-old couple in 2017 will spend an average of $275,000 on healthcare over the rest of their lives, a 6 percent increase over 2016. Meanwhile, the age at which we’re having children has gone steadily up over the past couple of decades, meaning people are more likely to be raising children into their late 40s and early 50s. And a tough job market coupled with significant student loan debt has kept millennials living at home longer. Half of the 40- to 60-year old adults surveyed admitted to supporting adult children financially, either in part or in full. Being stuck in the sandwich has huge consequences: emotional, physical and financial. If you think you may be headed for the sandwich, it’s time to take stock of your options and do a little planning ahead. Experts in building resilience will tell you: Control those things you can control and leave the others on the sidelines. That’s good advice in this scenario. It may be tough to predict whether your children will reenter your home as boomerangs, but you can at least start to get some indication of how your parents are situated financially for their futures. You may even be in time to help them shore up their situations. Begin by taking stock of your parents’ assets and liabilities, says Chris Rogers, Portfolio Manager with Carroll Financial in Charlotte, NC. It’s important to know where your parents stand financially so you aren’t blindsided if they run out of money—plus, you can help guide them. Take stock of any debts and liabilities, assets such as their pensions and Social Security income, and health insurance, as well as what they’re generally spending compared to what they have. If they’re reluctant to begin this conversation–or to get specific with the numbers–that’s understandable, Rogers says, as this generation tends to be pretty private about their finances. But you’ll want to keep circling around the issue until you have as much information as possible. When it comes to your children, there’s a big difference between those who are getting on their feet or temporarily recovering from a setback and those who seem to be permanently on the family payroll. The problem, Rogers says, is when you have adult children being supported who should be able to support themselves. "If you've got the kids educated, out of college with no debts, you've done what you have to,” Rogers says. 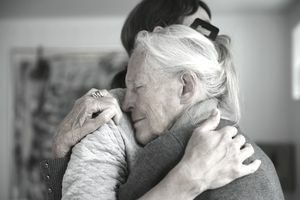 “Sometimes tough love is necessary.” If you do agree to financially help out an adult child going through something like a divorce or a job loss, make sure it’s clear how long you’ll be supporting them, what that support will entail, and what their responsibilities are as long as they’re living under your roof or taking your funds. Another strategy is to make a loan instead of a gift to your kids if they're in financial trouble. If you go this route, Rogers notes, get the terms in writing. When you’re supporting struggling young adults or dependent elders financially, you’re also supporting them emotionally. According to Pew, almost a third of people in this cohort admitted to feeling constantly rushed, and science tells us that time stress—the feeling of not having enough time in the day—is a serious detriment to life happiness. Women, in particular, are affected by the phenomenon, since they are the ones traditionally expected to care for children or aging family members. Many people in this situation are more focused on cutting costs than getting value, says Sarah Newcomb, a behavioral economist and author of “Loaded: Money, Psychology and How to Get Ahead Without Leaving Your Values Behind.” That’s a big mistake. While taking care of a parent yourself without bringing in respite help can save you some money, those savings may come at the cost of your emotional well-being, quality of life, and productivity. Finally, Newcomb advises paying attention to the stories that we tell ourselves that are contributing to the pressures that we feel. She suggests that people who feel sandwiched start by asking themselves a few questions: What does it mean to you to be a good son, daughter, or parent? How might this narrative be affecting the financial or emotional pressures you’re feeling? For example, Newcomb observes that some people think that a good parent pays for college, or that a good son or daughter would never put their parents in a nursing home. Consider whether you're harboring a “martyr narrative” of sacrificing your own needs to care for everyone else’s. The next step can be going back to some options you may have previously taken off the table. Maybe you believe your brother is irresponsible, so you have to drive mom to all the doctor’s appointments and cook meals. Or maybe you believe that hiring a nanny for your kids makes you a bad parent. Recognizing and reconsidering some of these narratives can be incredibly liberating.